Did you know that we received £1.1 million last year from people like you raising funds and donating? THAT'S EQUIVALENT TO what we spent in the same year providing information, campaigning on the things that matter to people living with MS and funding research to improve services, treatment and support. Your support really does make a difference for everyone who contacts the MS Trust. Every person who wants to know how they can manage a new symptom, choose between treatment options, find better ways to cope at work or support a family member who has been recently diagnosed. We can only be there at the end of the phone or online thanks to you. When we talk about fundraising, we're not just talking about extreme challenges and activities like running, skydiving and trekking. Last year we received £2,824 thanks to people who remembered to visit our page of shopping links before they shopped online with stores like Amazon, Sainsbury's and John Lewis. That's enough to run our freephone MS information service for a week. We rely on lots of generous people who take time out of their busy lives to do something - anything - to help people whose lives are affected by MS. That might be getting sponsored for a personal challenge like giving up chocolate for a month, selling homemade jam or greetings cards, or holding a charity event like an open garden or pub quiz. Almost 3,000 people supported us in 2014 by raising funds or donating and we are extremely grateful to every one of them. You can read some of their stories online in our Fundraising Hall of Fame. At the end of last year, Jennifer Cooper's Rainbow group raised £180 by holding a sponsored obstacle race as part of our Reindeer Rally campaign. Jennifer, who lives in Bradford, told us that she wanted to support the MS Trust because her family had found our information useful when her mother was diagnosed. She said, "My mam was diagnosed with MS eight years ago after living with it for more than twenty years undiagnosed. When we first found out it was hard to come to terms with because we knew nothing about it, but the hardest thing was telling my then eight year old niece and six year old nephew." "This is where the MS Trust came in. The literature they supply is amazing and made it easier to explain to my niece and nephew what was happening to their Grandma. When the opportunity came for me to be able to give something back I had to jump at the chance. I knew my Rainbow unit would thoroughly enjoy the Reindeer Rally. We can't wait to do it again next year." Thanks to Jennifer and the children at Rainbows, we can now provide copies of our Kids' guide to MS and the accompanying book for parents, Talking with your kids about MS, to help another 30 families who are in a similar situation. There are all sorts of ways of getting involved and raising funds, which help us do all sorts of things to help people with MS - from producing this newsletter every three months, to training each new MS nurse that comes into post. If you would like to help raise funds to support the MS Trust's work, we can find something for you. We run a programme of fun events throughout the year, some of which are listed to the right; we can also provide support materials for any fundraising activity you'd like to do independently. And there are lots of different ways to donate, including setting up a regular monthly or annual gift by Direct Debit, playing our weekly lottery or supporting an appeal. With your help we can make even more of a difference for the 100,000 people living with MS in the UK, and the 100 people who are diagnosed every week. 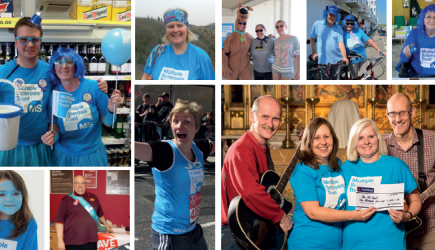 For more information, please get in touch with our fundraising team on 01462 476707 or fundraising@mstrust.org.uk.